A bizarre video which conspiracy theorists believe shows a military jet being ‘chased’ by a UFO has sparked speculation online. 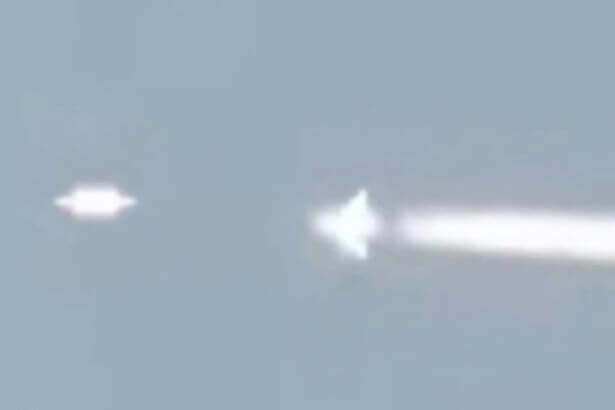 In the footage, the mysterious, saucer-shaped object emerges from behind the plane’s contrails and appears to follow the aircraft. It then eventually overtakes it. The cameraman was reading at home when they zoomed in to capture the bright object flying near the jet in the skies over Lincoln, New Hampshire. They said: “I was reading on my deck around 7 o’clock. “This happens all the time, jets and helicopters are a common sighting. So I naturally saw the jet and did a double take, because there was something following it. “I immediately thought I was witnessing some strange aircraft, possibly military but it was not a jet. “I knew it wasn’t a jet because it was actually right behind one. The jet it was chasing left a long contrail behind it, but the UFO did not. The footage was originally captured in 2016, but reemerged on YouTube this week where it has racked up thousands of views. “I watched the object gaining on the jet for about 10 seconds when I lost them in the trees,” the witness added. “I was very excited and anxious. I felt I has witnessed something very hard to dismiss as a ‘weather balloon’ or some obvious type of aircraft. But not all viewers were convinced the video was proof of alien visitors , with many thinking the object was just another plane.